Today was a pretty quiet day for us as we had the family potluck yesterday. My own children were not able to make it home. 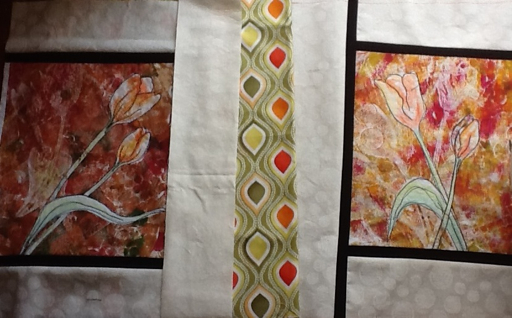 I tried to get my four tulip prints finished and sewn into a runner for yesterday but I didn't make it. 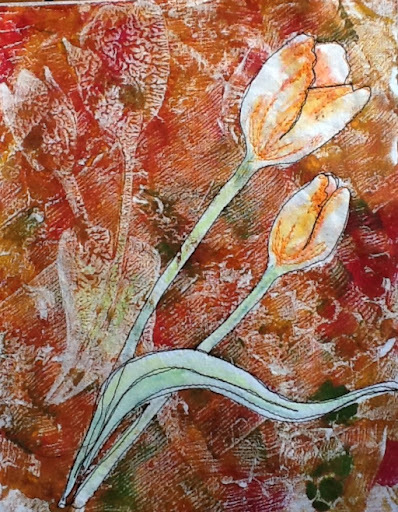 I did some thread painting in orange, although that's not quite finished, and some free motion black around the tulips. 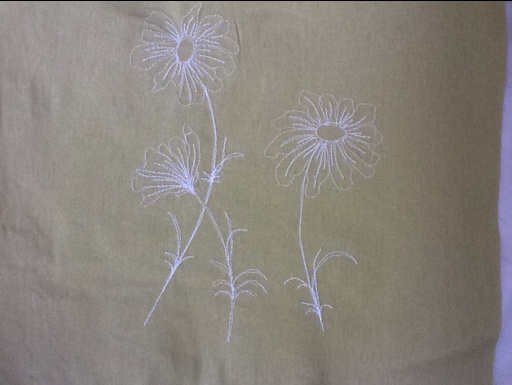 Each one will be bordered in black then a tone-on-tone and eventually sewn into a runner. This one doesn't have the orange stitching on it yet. I'm pretty pleased with how they are turning out though. I think it will be quite a pretty runner. 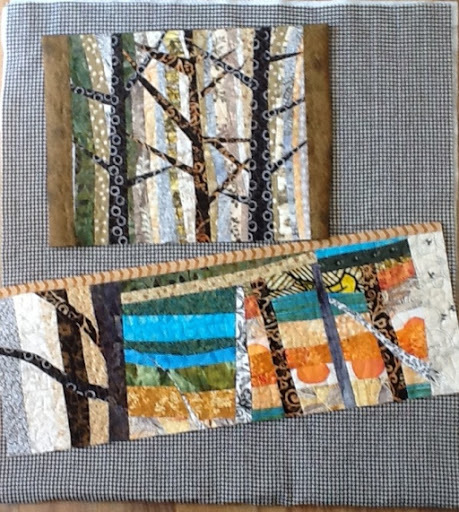 In the picture below, you can see a small sample of the fabric I plan to use in between each block. It's been quite a lovely day here today although still Not very warm. 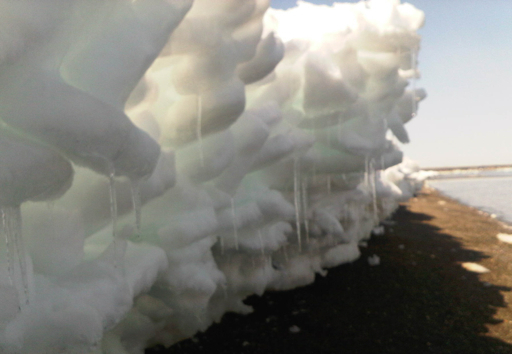 There's still lots of snow and ice around yet to keep the air cooled. While at the in laws, we ventured out on the beach for a little stroll. We had to find a spot to get down over the ice to the sandy part of the beach where it was fascinating to walk almost underneath the melting ice bank. 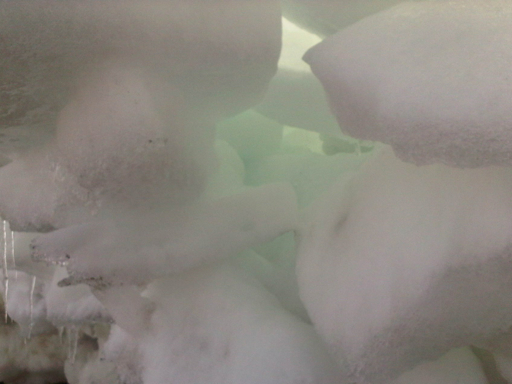 There were some very pretty colors in between the stacks of ice blocks where the sun was shining through. This morning I'm going to make a vegetarian lasagna for my potluck tomorrow and then I'm free to relax. 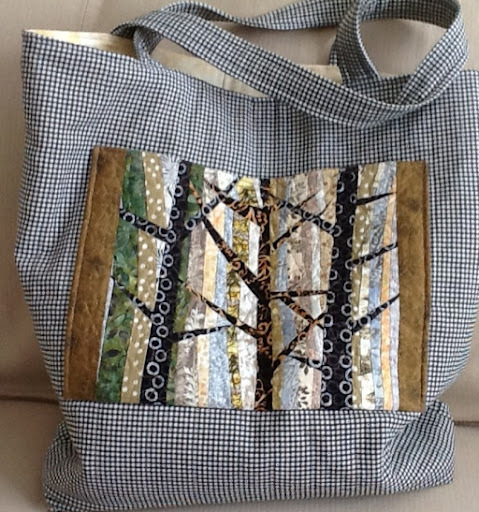 I plan to walk- its beautiful out- and do a little sewing. Last night, I couldn't resist adding a little Neocolor II crayon color to some of the tulip blocks and then i did a little free motion stitching to see how it will look. In one spot I doubled the line and I think ill do that to the rest. I'm doing four blocks right now for a runner. I'm not going to over stitch these since its not going to hang on a wall. Earlier this week I came across this crocheted Easter egg tutorial at Greedy For Color and on a whim decided to try a few. They are fast and fun to do. I'm off for an appointment at the occupational therapist this morning, and then to a friends for lunch and some sewing. I was out most of yesterday, swimming and then tutoring, but I did make another couple of blocks for the scrappy Trip Around the World. 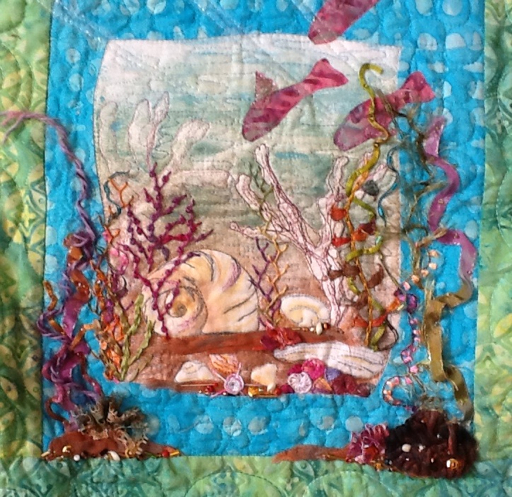 This will be a project that I will do here and there in between art quilting so don't look for a speedy finish! I've chosen to use up my black and white prints which won't have the impact of solid black. I think it will work though. What so you think? 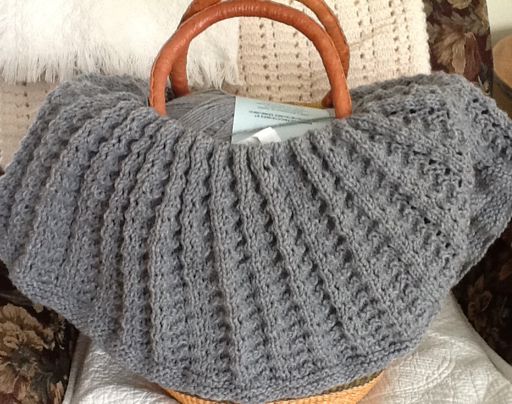 On the weekend I picked up the bag that my friend Elise put together for me. I did the artwork and quilting and she helped with the basic construction. 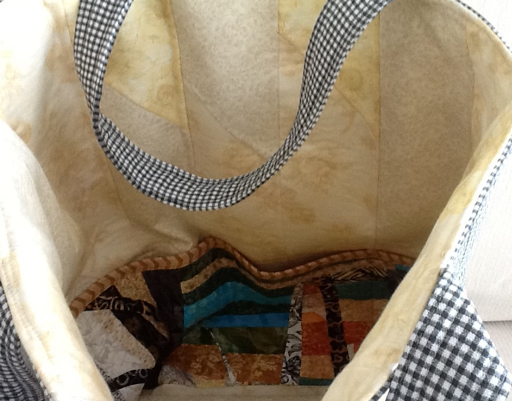 Below is a view of the front of the bag. It's quite large-- fits a medium size cutting board-- and even my medium sized Rubbermaid container that I carry my projects in. 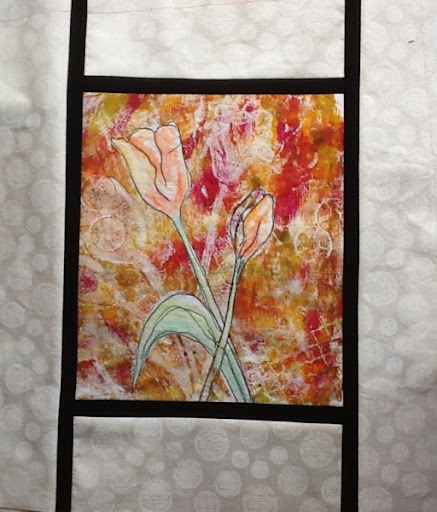 The back has another piece of my art quilted and made into a pocket. Even the inside made use of my discards. It'll be a bag to treasure. 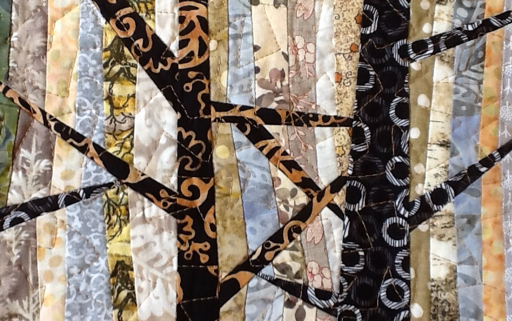 The April/may issue of Quilting Arts is out where you can read my latest article. I'm still waiting for my copy. 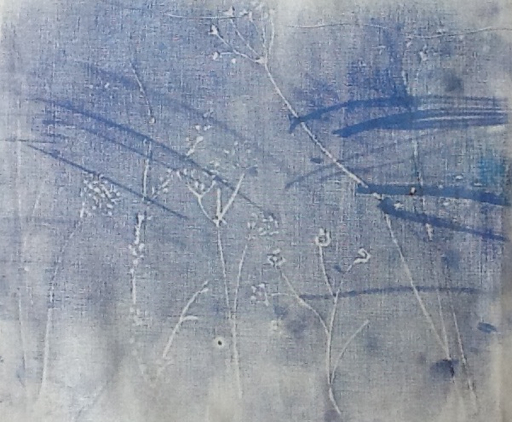 This afternoon, I finally got around to a short fabric printing session. 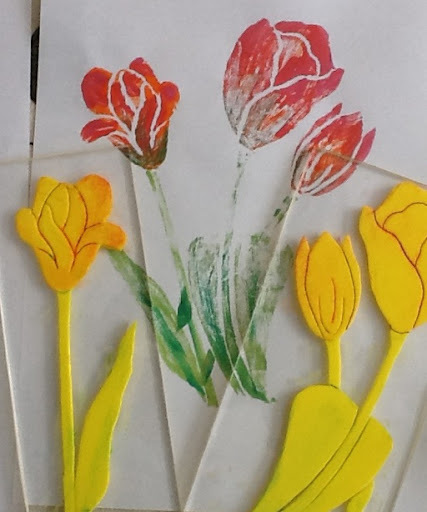 I did 8 pieces using the tulip motifs. I'm thinking about making a table runner with a few of them. 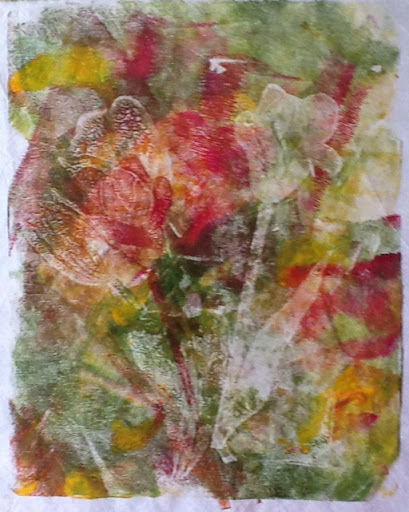 I used a combination of my foam stamps-- they're the subtler images-- and paper as masques. I did my weekly housework and some wash this morning. We may still be under a couple feet of snow but it is brighter and you know it's getting better when you can hang the sheets out! After lunch I put together the 2nd cushion, finally, and took this picture. As you can see, I don't like my sofa cushions to be too firm. The spring green color is still not coming through. I even tried my good camera with similar results. For the rest of the afternoon, I've been siting with my knitting while watching a movie. Tomorrow, I'm hoping to have the energy for some creative playtime. 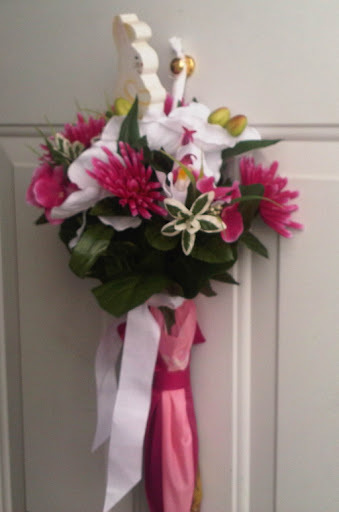 My mother in law found this idea of a bouquet in an umbrella on the Internet. The picture could be better as the bottom of the umbrella is cut off. I had my husband take it with his cell phone and I guess he was just thinking of the flower part. This one is made in a kid's size umbrella. Isn't it cute? Ok, enough already, spring is supposed to be here and it's been snowing ever since! 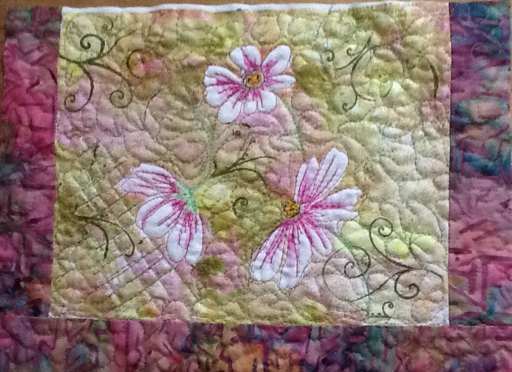 I wanted to finish my second pillow this morning before I go out, but I felt the need for a little spring time color. 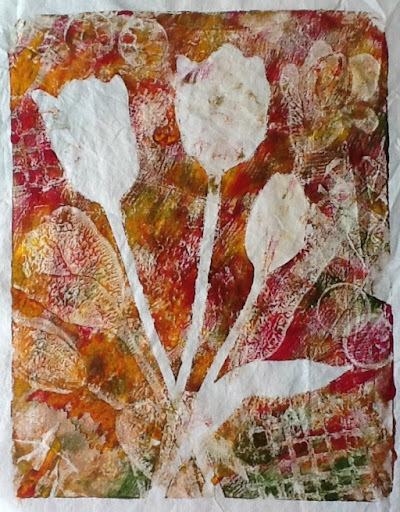 I sat and cut out a couple of foam tulip stamps and then tested them on paper. I quite like them and I think they'll work great on the Gelli and on fabric. I might have to try one more in a longer thinner version. These measure about 3 by 8 and 4 by 8 inches. Yesterday, I had an appointment at occupational therapy where they made splints for my wrists to sleep with. I don't have carpal tunnel; the rheumatologist ordered them to help with osteoarthritis in my fingers and wrists. They're perfectly comfortable but I slept fitfully with them and after a nightmare at 5:30am, I took them off. I hope it's just a matter of getting used to them! Next week, I'll be getting something for my fingers and toes. It'll be a scary site if I'm all wrapped up in all of it! Today, I went for my swim since I missed it yesterday. This afternoon, I put together a pillow form for my new pillow. Why buy one when I have this huge bag of stuffing taking up room in my closet? I was afraid it was too plain with my neutral sofa and wall color which are both shades of beige. 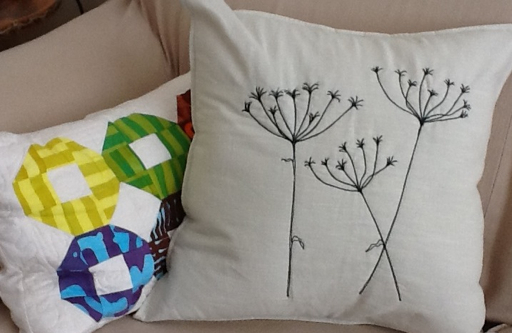 I think it stands out well enough and perhaps I'll make a couple more more colourful cushions. 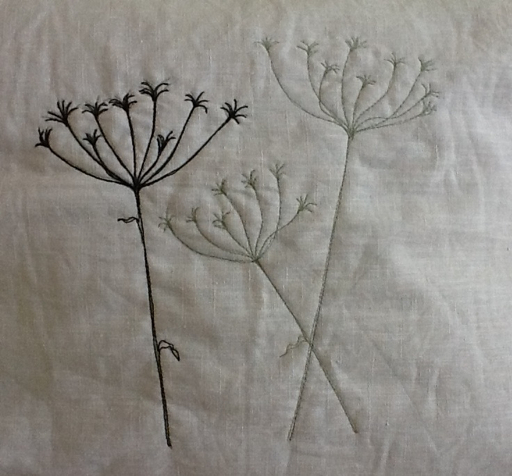 I've been working on a second one on a lovely mossy piece of linen. I tried taking a photo in several locations and lighting but the nice green color won't come through. It looks brown although its really a nice springy green. I've cropped the photo so I think I may actually add a couple more flowers to fill in the space. I've free motioned the cosmos while using one of my sketches as a reference. With the onset of spring, even though winter is having its last gasp this week, I've felt the need for a few changes in the house. Some of you may have noticed some of the sofa pillows with the botanical theme that have been featured at some sites on line. I decided to pull out some scraps of linen and have a go at a couple. Maybe you'll recognize the motif from a sketch that I did this past winter. It's going to fit an 18 inch form. I started off using a regular weight cotton thread in green but the impact was not what I wanted so I'm loosely stitching over it using a heavier top stitch thread. The only colors I could pick up here in town were black, white or ivory. 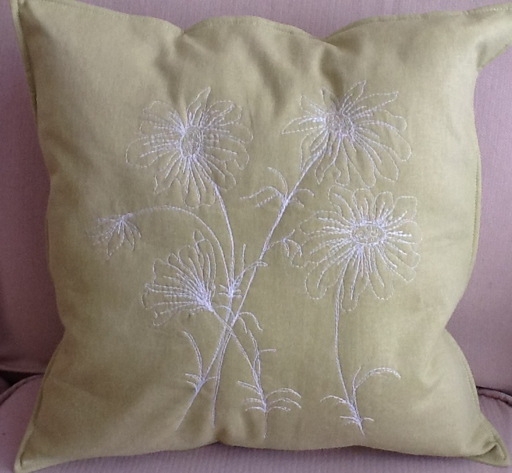 My second pillow will be on a mossy green linen so I may try the ivory thread. The sun is shining brilliantly today, but it's clear by the temperature and the cold, biting wind that winter is not going to let go easily. Will power alone got me out for my walk. At least once I'd made the short bit to the trail, it was quite lovely out of the wind. I've made a creamed fiddlehead soup for supper using some fiddleheads from the freezer. And I made two loaves of oatmeal bread to go with it. It's been a satisfying day because I finally finished up all the parts for my bag that my friend Elise is going to put together for me. The bottom one is an inside pocket and the top one will go on the outside. 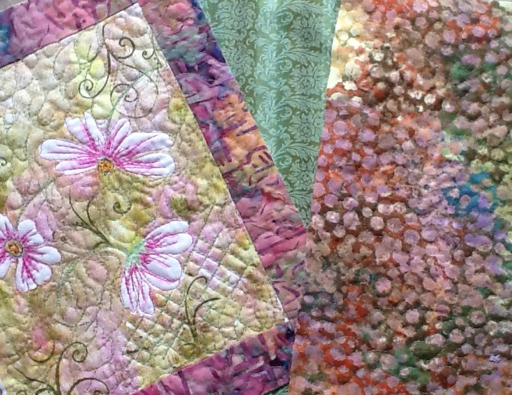 I have quilted them in what I call a meandering zig zig. Perhaps there's another name for it. 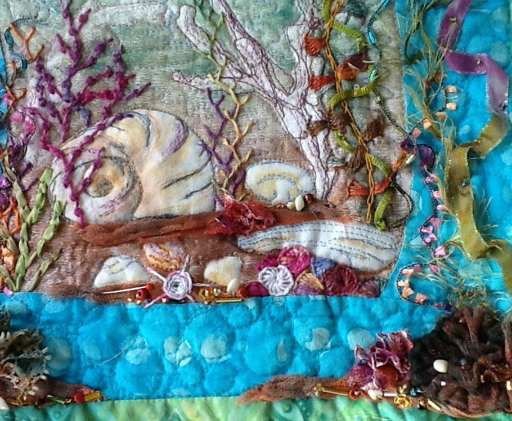 This morning, I received my art work back from Quilting Arts. 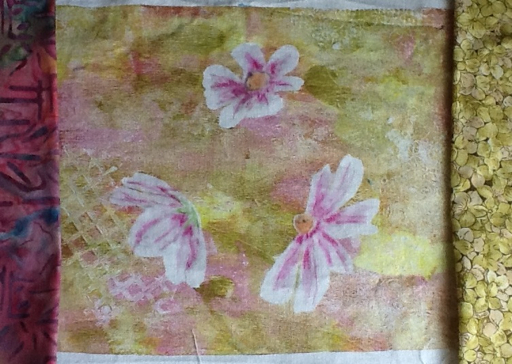 This piece was done using the shibori method that I write about in the article in the April/May issue, but it is not pictured there, nor did I show it on my blog when I did it. It is reminiscent of a fall or spring morning on my NB Trail. 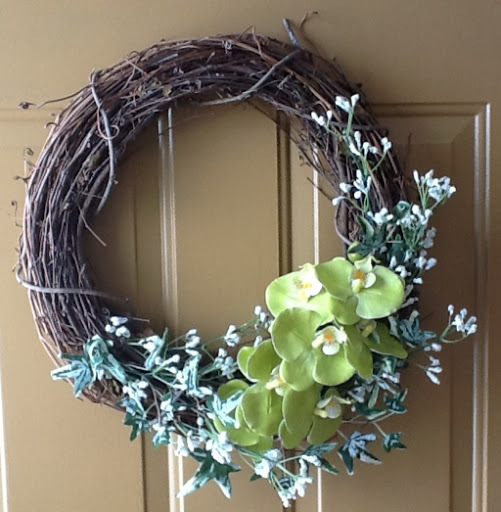 On the way home from my guild UFO day today, I stopped at a local department store to pick up a few things to make a spring wreath. I bought the twig wreath and three pieces of foliage for $17 and it took me 10 minutes to put it together. I used wire cutters to cut the stems apart and a small bit of hot glue. I filled a basket for UFO today with all my hand embellishing paraphernalia including some ribbon, some beads and some threads. Some of you might remember this piece that I'm revisiting. I had removed part of the binding and lifted the back (i always add a piece of fabric to cover the back when I'm done) so that I could add more embellishment. I'm finally near to calling it done, just doing some beadwork. I'm not sure if it's improved it or not, but I have had fun learning some new stitches. I've taken these photos with the I Pad. When I've completed the piece (again), I'll take some with my good camera. I've had a week where I've been in and out a lot and so have not had large blocks of time to be creative. This morning I had my mammogram and I breathed a sigh of relief when that was over. They do have a new machine here, though, and I have to say that although painful, it was not as severe and at least faster. I had about an hour before my walk this afternoon and decided to finish up a couple of stamps I'd been working on and test one out. Since I've said from the beginning that my blog is about my process, and even the not so great ones, I'm showing you the error of my ways today. I wanted to test my fun foam sketch on fabric and the results were not great. This is the piece of craft foam with the drawing incised into it. Using my brayer and Setacolor fabric paint, I rolled out some color onto the foam and laid a piece of white cotton onto it. I tried it twice and both times ended up with streaks. 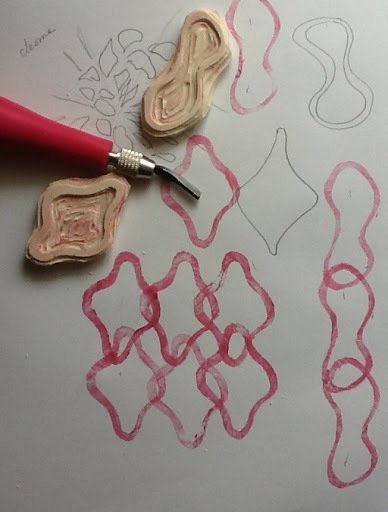 I think it had something to do with the paint on the brayer but I didn't go any further to test my theory as I can see that I do need to incise the lines of the drawing a little deeper first. I've used the fun foam many times using the same method in the past and had no problems. I think I may have applied the paint with a sponge brush though so I'll have to do a little experimenting. Tomorrow and Saturday I'll be out again so perhaps next week I'll get to it. I finished stitching this zippered pouch that I started last week. It makes me happy to make something useful with my art. This next picture one gives you an idea of its size. It's a lot bigger than the last one I made. I've also been playing around with some doodles. Margaret Applin is making some screens for me. You'll find her blog button on my sidebar. 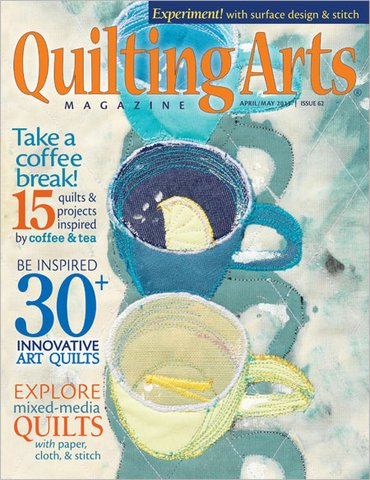 Another thing on my sidebar is a picture of the April/May issue of Quilting Arts magazine where I have another article. I know, I sound so blasé! But believe me, it really is as exciting as the first one! I can't wait to see it! Yes, in case some of you have been looking, I've been a little out of my creative loop. I'm not stuck, just needed a breather after finishing things last week. I took some time to sit and watch the season 1 of Downton Abbey while I did some knitting. I love doing a mindless afghan that is knit in one piece on circular needles. It's very relaxing. Then, my youngest son was home for the weekend. He and his fiancé have become godparents, something a bit alien to him as he grew up United although we don't attend now. Today, I needed to get some clean up done and my daughter messaged me early this morning from Korea to get me to Skype with her. I sat down around 2 to do a bit of sewing on a pouch. I should be able to show it tomorrow. 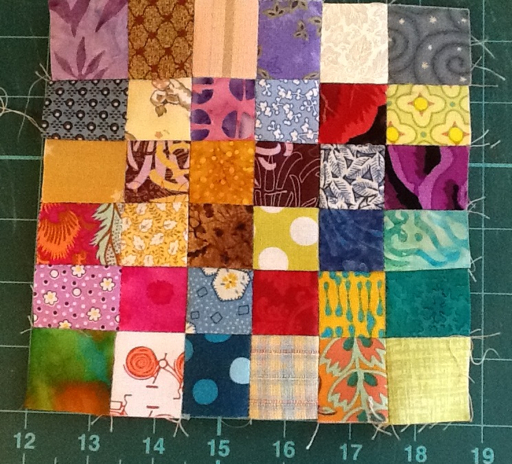 Yesterday, just to get in a little sewing fix, I made another one of the Trip Around the World blocks. Now I have two! I like to keep some traditional quilting on the side because it gives me a bit of a break in between my art quilting projects while I'm pondering where I'll go next. It is a really fun block which I will work on here and there, probably over the next year. 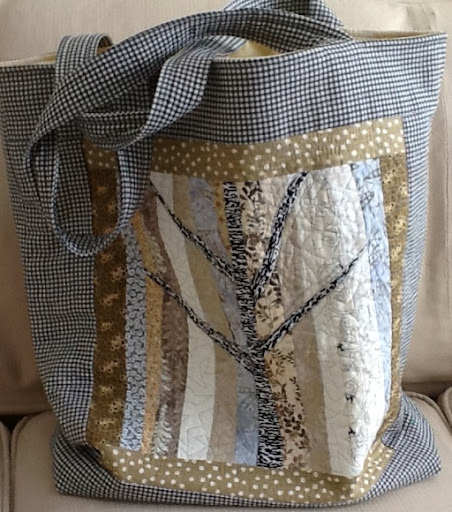 Yesterday, my friend Elise came over and helped me to get the pieces cut for my bag while I finished sewing together my reject parts from when I was playing with piecing trees last fall. This one is totally random, really makes no sense at all, but I thought why not use up all scrap the pieces for an inside pocket. Now, it's already to quilt. Then, I found this next piece which needed a few strips on one side. I did that while Elise cut the pieces for the backing and the lining. It will be an outside pocket. I'll hopefully get them quilted over the weekend and then all the parts will be ready for the assembly. 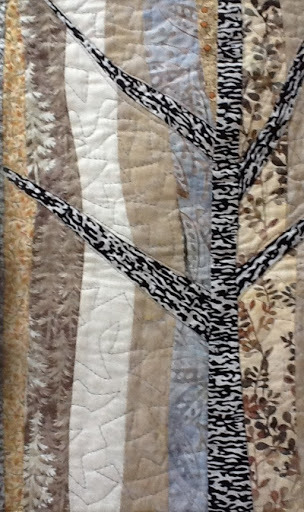 I spent today sewing on my postage stamp quilt at another friends. After the dreary week, it was really nice to get out for some company. I just have a couple more blocks to finish. When I arrange them to add the dashing, I'll take a picture. I'm stuck inside for the third day in a row with wet snow stormy weather and it is getting annoying. If you know me, you know how I like to get out for my walks! Anyway, I've been managing to keep busy. I stippled a piece of fabric for the back of the zippered bag that I'm making and cut a lining. Now, I just need to get out to get a zipper for it. Tomorrow morning, I'm going for my lap swim with my friend Elise who is then coming for lunch. She is going to help me with the bag I started a while ago. Actually, she's going to put it together for me. 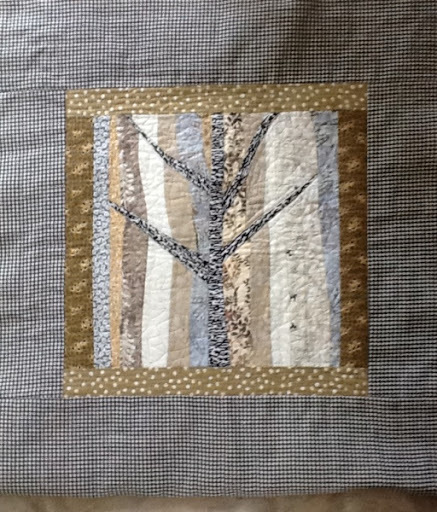 I stipple zig zagged around the tree and then straight stitched the rest with parallel lines. I've laid out some reject pieces from another project and I'm piecing them together willy nilly to make an inside pocket. Might as well use the fabric and it won't be too closely scrutinized there. Now, I'm going to make a cup of tea and watch another Downton Abbey episode. It's another dreary, wet, snowy day today with apparently more expected tomorrow. It sure doesn't make one anxious to get out of bed and get going especially when the body is aching and there's housework ahead! I dragged myself out though, got over it and got the chores done so I could get to a little stitching fun! I added 3 borders to the cosmos to make it a good size to make another pouch, sandwiched it and did some free motion stitching and quilting. Some might think it a bit of work when it's going into something utilitarian but I see it as a way to play with thread and use up pieces I might not use. Next, I have a confession! I've gotten Downton Abbey, season 1, back from my mother in law who I bought it for, and I've decided to start watching it. I'm not much of a TV watcher, especially during the day but I've put it on twice now while I'm working on some hand work. I am getting into it! The color is much richer in both these photos than is showing so I will try to take some next with the good camera. 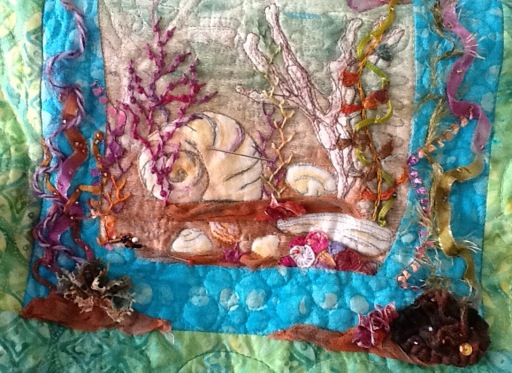 This is a piece that I decided to re embellish, adding lots more. It's slow work but very relaxing. It is an improvement, I think. I'm having fun at least. At UFO day, yesterday, I worked on more blocks for my postage stamp quilt. This has been a WIP for the last couple of years and could take some time yet, as I will save it to take to our twice monthly UFO days. 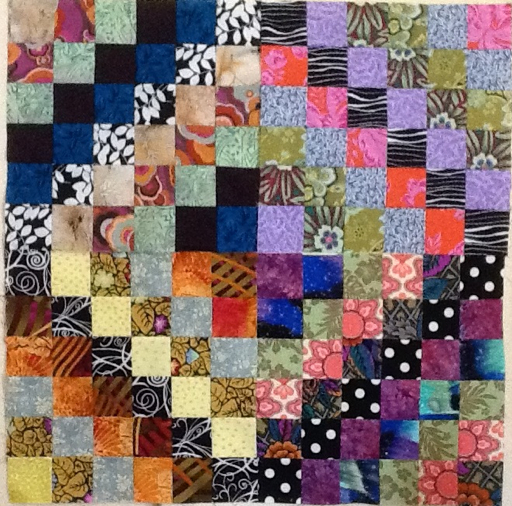 There are 9 four patches of 1 1/2 inch squares that I put together into block that will finish at 6 inches square. I devised a star to fit it into to make it a 12 inch block. 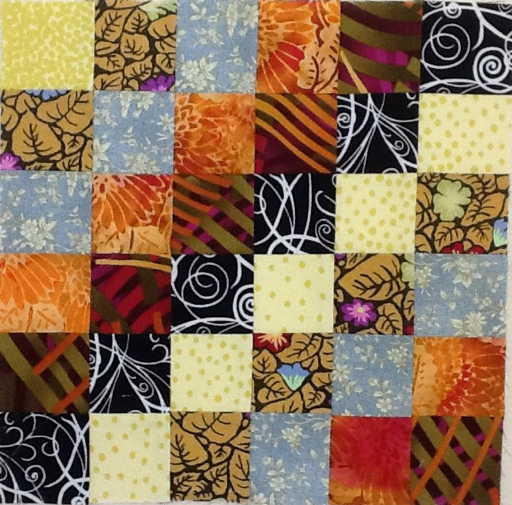 I've decided to do 20 blocks to sew into a 4 by 5 block section with black slashing. I have 6 more blocks to go! Also, I'd like it to be for a queen size bed so I will have to add some sort of border. I'll keep you posted when I get enough done to start the dashing. Another block that has intrigued me lately is the scrappy trip around the world that has been popping up all over the net. Check these ones out. You'll find a link for a tutorial there as well. Caution though! It's addictive! 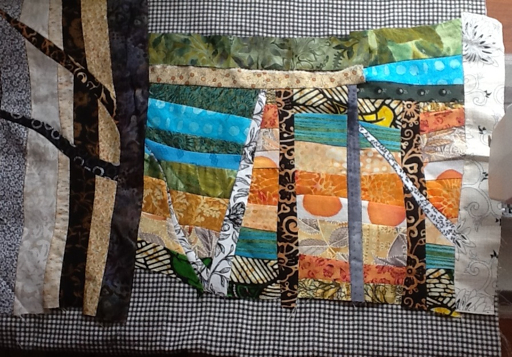 Recently, I've been cutting strips from my stash and I ordered a jelly roll. Since I have a box of black and whites, I wondered how the block would look using those for the diagonal as opposed to a more solid black. I tried one out this morning and I think it works nicely. I'll have to to 3 more to really see the effect. The blocks in this are 2 1/2 inches so it finishes at 12 inches. 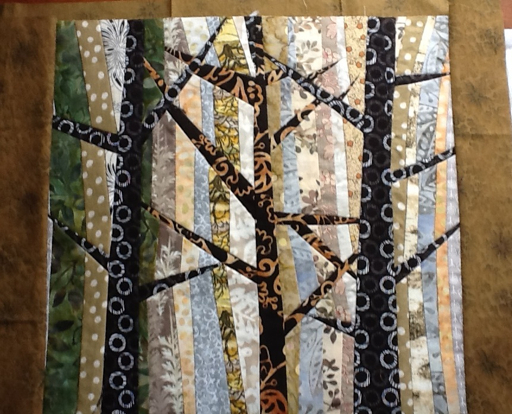 This will also be a quilt that I will do over time. Sometimes I need a little art break while I'm collecting myself for the next project. I like to have these no brainer projects to fill in. I think this will be a week when I will be cutting, cleaning and finishing up some projects. 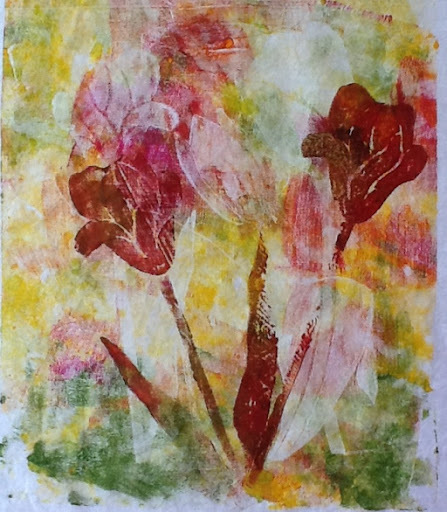 This printed piece was a reject, but I've just added some paint to the petals and matched some possible fabrics to it. I will add some stamping and some free motion stitching and it will become another small pouch. I'm off to make a lunch and then head out for an in law visit. I hope you're having a relaxing Sunday. Today was my errand day and I also have lunch with friends and tutor so definitely no time for creative arts! I was just able to find the time to test print a couple of stamps that I carved last night. Mmmm, the way I have them stamped reminds me of chain link fences and chains. I wonder what that could mean! Tomorrow, I'll be going to guild UFO day where I'll be working on my postage stamp quilt. I keep it packed in a box just for these days and I don't touch it in between. I hope you all have a creative and relaxing weekend!